I found 41: A Portrait of My Father to be a very good read. I have always admired President George H.W. Bush and after reading this book I admire him even more. To be the youngest fighter pilot in WWII says something about a man. Then to jump out of a airplane at 90! Seriously one strong person! His life had many ups and downs - many I did not know. His political career was very interesting. I guess I like others assumed that his political career was easy - it was not. One of the things that stick in my head is that the Reagan's never once invited Barbara Bush to the White House. Gosh who does that. She was the Vice President of the United States wife. 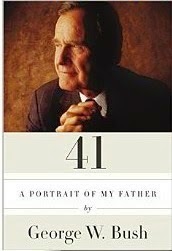 If you are like me and like non-fiction give 41: A Portrait of My Father a chance. I think you will be pleasantly pleased. I liked him as a president also. Sounds like a great read! While I wasn't a fan of the Bush's I would love to read this.